Algorithms are the brain of software. They refine complex data into simple conclusions and smart decisions. They boost processes to save time and money. They perform tasks impossible earlier. Algorithms have so clear and remarkable benefits that they should be available to every company and individual. 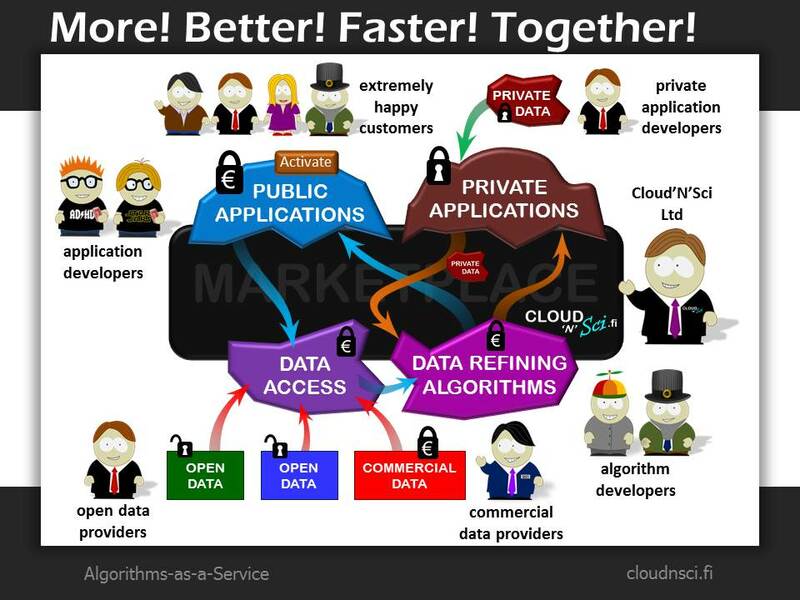 That's why Cloud'N'Sci Ltd has created the Algorithms-as-a-Service (AaaS) concept and this marketplace. We believe that this marketplace will start a new era in open data based business! Cloud'N'Sci invites algorithm and application developers to join the ecosystem. Take a closer look at the AaaS concept and you shall find the underlying business model irresistible. The Cloud'N'Sci.fi marketplace offers algorithm developers a shortcut to global markets and makes solutions available to a wide range of business applications. Application developers benefit from the marketplace through reduced R&D costs and risks, improved data quality and rapid market launch of new analysis functionality. Welcome to join the business! Check our SlideShare presentations and wiki pages to learn more about the Algorithms-as-a-Service concept.